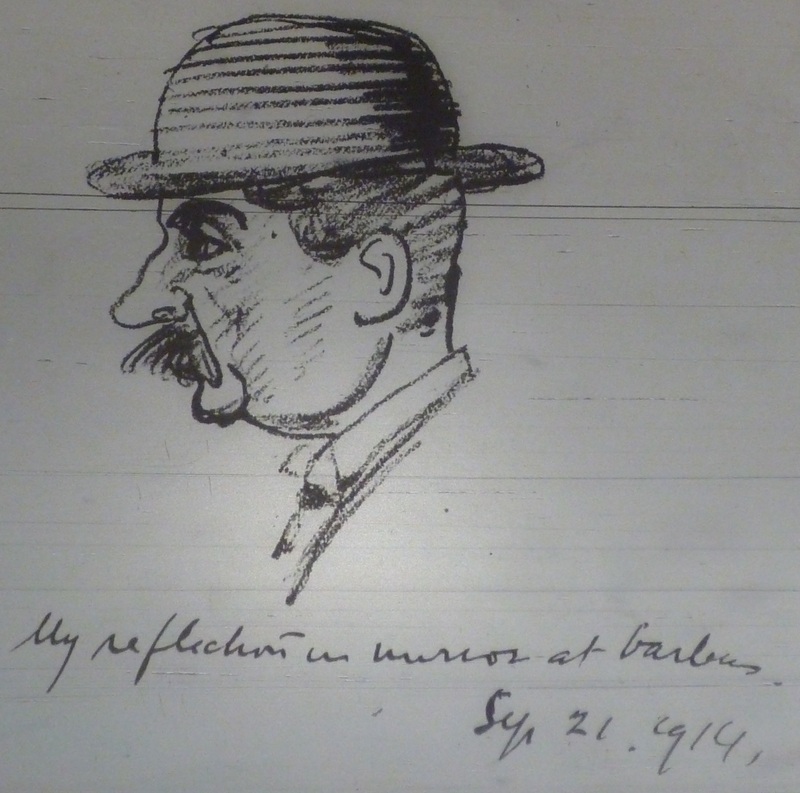 Joseph Holloway’s self-portrait “My Reflection in Mirror at Barbers,” 21 Sep. 1914. National Library of Ireland. On Friday, 31 July 1914, Joseph Holloway – the sometimes architect but more often theatregoer – recorded a moment of cultural angst: “Was at two picture Houses during the day – the Grafton & Rotunda, where a few good films were on view,” he noted in his diary before adding: “It’s terrible to be driven to see pictures instead of plays! I fear the theatres in Dublin are dead for the present.” The death of theatre in Dublin was a cause of serious concern for Holloway, whose diary records the minute attention he paid to shows at Dublin’s “legitimate” theatres – the Theatre Royal and Gaiety – at its melodrama house – the Queen’s Royal Theatre – and at its music halls – the Empire and Tivoli. Despite his unhappiness with theatrical offerings at this time, he nevertheless attended as many plays and shows as he could fit in a life largely filled with the leisure that a small inheritance allowed him. The diary in which he records the details of these shows – as well as his conversations and correspondence with the luminaries and ordinary people of the time – is an incredible work of life writing that has been estimated as running to more than 25 million words (Ferriter). This is not because of the great critical insights he offers; his diary has been described by Irish author Frank O’Connor as “that donkey’s detritus” and by Sean O’Casey as “an impossible pile of rubbish” (ibid). Nevertheless, despite the limited perspective of a middle-class conservative Catholic nationalist, it offers fascinating glimpses into life and leisure as they were experienced in Dublin in the 1910s, including the city’s emerging cinema culture. Holloway’s viewing of the two film shows in late July 1914 was not unprecedented, nor was it the first time he had expressed his dissatisfaction with picture houses while being a regular cinemagoer. 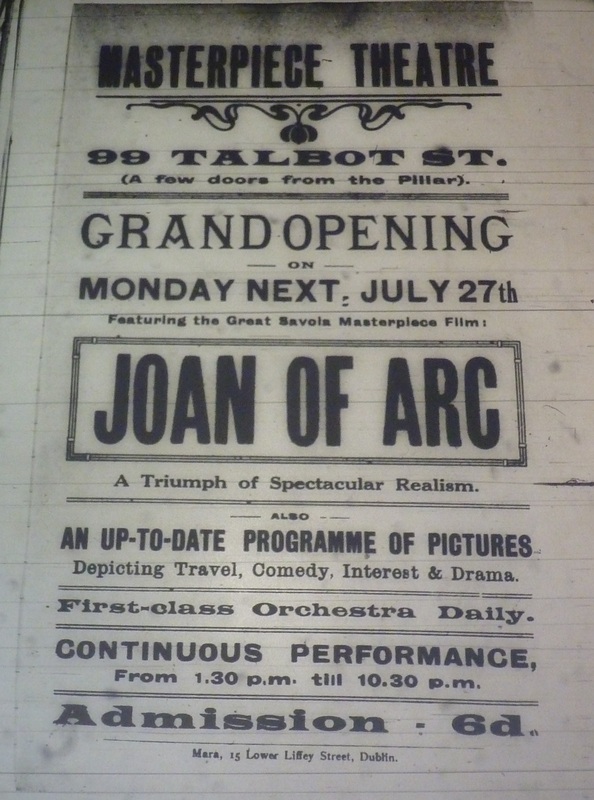 Since the Picture House in Sackville/O’Connell Street had opened in April 1910, Holloway had often visited it and the other picture houses that opened with increasing regularity in its wake. Although he sometimes visited picture houses alone, he also accompanied his mother Anne Holloway and his niece Eileen O’Malley, with whom he lived, demonstrating the popularity of the picture house across three generations (Condon 143). By September 1914, Holloway’s life was changing along with the city’s entertainment offerings, not to mention the political upheavals of the period. The death of his mother in May 1912, and the marriage of Eileen on 16 September 1914 left him living alone and without a cinema-going companion. As well as this, the breakdown of the longstanding distinctions between Dublin’s legitimate theatre, melodrama house and music hall was particularly visible just as the war began in the autumn of 1914. This was part of an international process by which entertainment companies were buying up and building theatres of all kinds to create chains that sought large popular audiences by providing a modified form of variety entertainment that could accommodate popular music hall artistes and dramatic actors, as well as film. 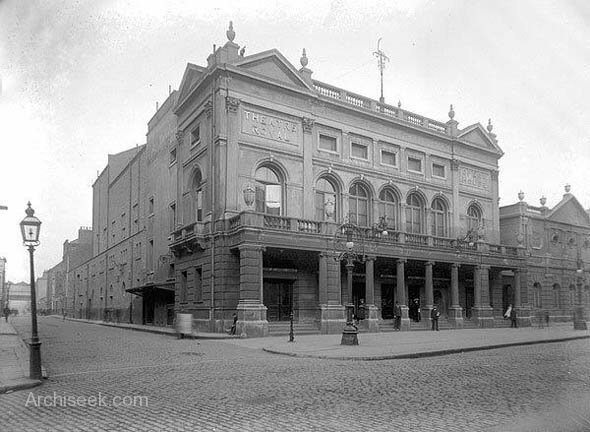 Dublin’s Theatre Royal had long been experimenting with this modified variety, which it called by a name already popular in many British cities: hippodrome. 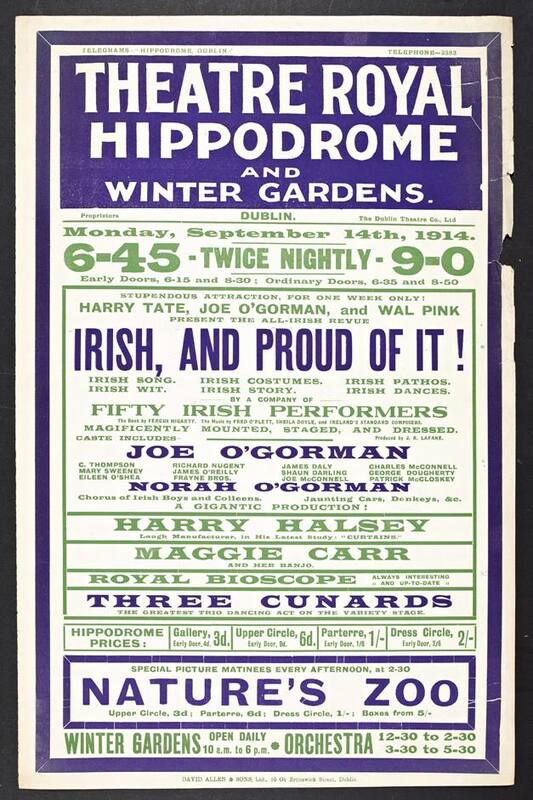 Marvelling at the popularity of the Royal’s hippodrome seasons during the summer period when the theatres usually closed, the theatrical columnist of Irish Life dubbed hippodrome “the Chief Priest and Apostle of the Music Hall in Dublin” (“Between the Acts”). “[I]ts hold over the public is simply amazing. The “two-nightly house” show can apparently thrive under any circumstances. In Dublin it has captured all classes, and has proved itself a most profitable undertaking to those engaged in it” (ibid). Film featured not only as part of the evening programme in the guise of the Royal Bioscope but also at a separate film matinee. Poster for the Theatre Royal Hippodrome and Winter Gardens, Sep. 1914, featuring film matinees of Nature’s Zoo (Britain: Cherry Kearton, 1913), a film that the Royal also exhibited a year earlier. National Library of Ireland. In early August, Ireland’s Attorney-General and Solicitor-General heard application for patents that would allow legitimate drama from the Star Theatre of Varieties, Ltd., the company that ran the Empire, and from the Premier Picture Palace (Dublin), which proposed to build a large theatre in the city centre on a site off Henry Street and close to the GPO. As the latter’s name suggests, this company had initially planned to open a large picture house but had decided that a variety theatre with the flexibility of mounting plays and showing films would be more profitable. The company would eventually open in April 1915 what was then known as the Coliseum Theatre, a short lived venue that would not be rebuilt following its destruction a year after its opening during the 1916 Rising. The proprietors of the Coliseum included Lord Mayor Lorcan Sherlock, two directors of Dublin’s Tivoli Theatre and theatrical agent Fred Willmott (ibid.). Holloway attended the hearing and spoke as an expert witness – “as an old theatre-goer with 40 years experience” – in support of the Star Theatre of Varieties’ application, arguing that the granting of a dramatic patent would benefit the city by providing the opportunity for more play to be performed (“What Is a Revue?”). While lobbying in support of more plays and continuing to attend theatrical shows of all kinds, Holloway also visited picture houses regularly. During July and the first half of August 1914, he records twenty visits to Dublin picture houses, fourteen of them alone in July. On the evening of Thursday, 2 July, he went to what he insisted on calling the O’Connell Picture House (but the proprietors persisted in calling the Picture House, Sackville Street) where he saw the “beautiful touching film ‘Child o’ My Heart’” (Britain: London, 1914); on the afternoon of Monday, 6 July, he saw The Afghan Raiders and When Lions Escape (US: Columbus, 1914) at the Rotunda, and “both were full of thrills!”; on the evening of Wednesday, 8 July, he saw the Western Love Triumphant and a newsreel of Joseph Chamberlain’s funeral at the Grafton; on the evening of Friday, 10 July, he saw From the Lion’s Paw and “a thrilling abduction story, both well acted” at the Rotunda; on the evening of Monday, 13 July, he saw The Game of Life (US: Selig, 1914) at the Rotunda, which he found “a particularly exciting one & also an Indian story of the new medical man” [The New Medicine Man (US: Kalem, 1914)]; on the evening of Saturday, 18 July, the films he saw at the Grafton included Lost at Sea (France: Eclair, 1913), Nan Good-for-Nothing (Britain: London, 1914) and a newsreel from Dublin’s Civic Exhibition featuring rival architect George O’Connor, “[a]s large as life & equally as massive!”; on the evening of Monday, 20 July, he admired at the Grafton both The Black Pearls (US: Geroges Méliès, 1914), “a real thriller enacted finely by French players,” and The War Bonnet (US: Kalem, 1914), “an Indian story [that] was fairly interesting chiefly because of its beautiful natural setting; on the afternoon of Tuesday, 21 July, he was amused by The Blood Test (US: IMP, 1914) and an unnamed comedy at the Rotunda; on Thursday, 23 July, he visited the Grafton, where he saw “a few good dramatic pictures & others I didn’t care for,” and later the Rotunda, where The Master Crook Turns Detective (Britain: British and Colonial Kinematograph, 1914) “was the most dramatic & best enacted”; on the evening of Friday, 24 July, His Reformation (Britain: London, 1914) at the O’Connell was the best of “the few more or less interesting pictures” he saw; on Monday, 27 July, he found Joan of Arc (Italy: Savoia, 1914) at the opening of the Masterpiece Theatre “dull and left after ending of part 3,” but enjoyed The Mansion of Sobs (US: Lubin, 1914), “a very good child picture & a funny [John] Bunny picture” later at the Grafton; on Friday, 31 July, he had the two visits to the Grafton and Rotunda that caused him such anxiety about the death of theatre. 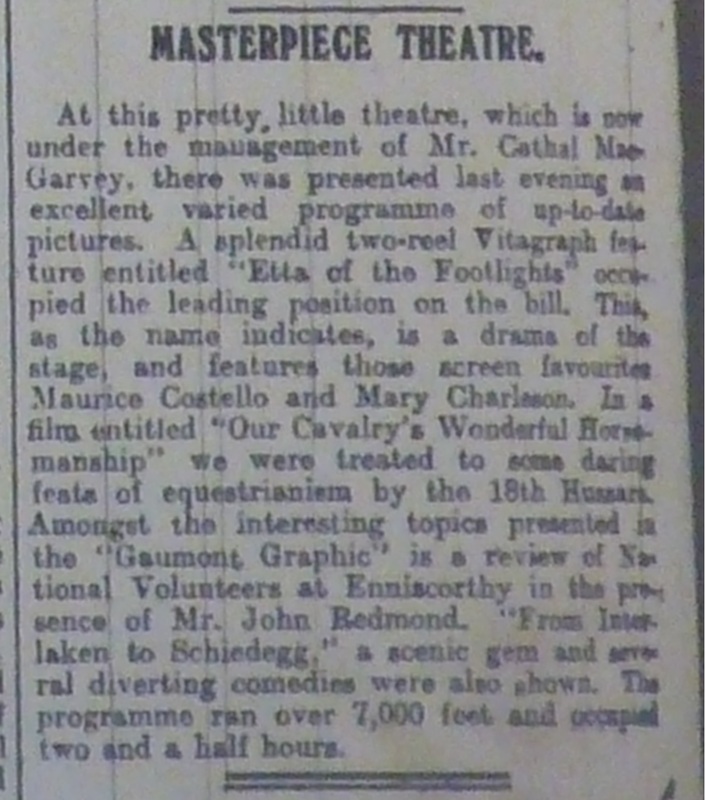 Evening Telegraph review of programme at the Masterpiece, 22 Sep. 1914: 2. Over this period, he attended the Rotunda and Grafton almost equally with eight and seven visits respectively. The O’Connell was his next most favoured picture house with three visits; and the Masterpiece and Dorset received one visit each. After the visit to the Masterpiece on 27 July, he appears not to have visited it again until two months later, on Saturday, 26 September, when the well-known comedian Cathal MacGarvey took over its management. Holloway “met Mr M’Garvey at the door – he has only taken up the reins a week ago & scarcely feels his feet yet – he hopes to work it into a big success – The programme was first rate & I told him so as I came out.” Holloway did not mention what was on the programme, but MacGarvey’s appointment drew some welcome publicity to the Masterpiece, and as a result, notices show that Holloway would have seen the drama Etta of the Footlights (US: Vitagraph, 1914) with Maurice Costello and Mary Charleson – which was also showing at the O’Connell – “some daring feats of equestrianism by the 18th Hussars” in Our Cavalry’s Wonderful Horsemanship, the scenic film From Inverlaken to Shiedegg, and a Gaumont Graphic newsreel that included “a review of the National Volunteers at Enniscorthy by Mr. John Redmond and (“Masterpiece Theatre”). It is likely that the location of the last film is mistaken and that this was a film of the infamous speech at Woodenbridge, Co. Wicklow, in which Irish nationalist leader Redmond called on the Volunteers to join the British Army. 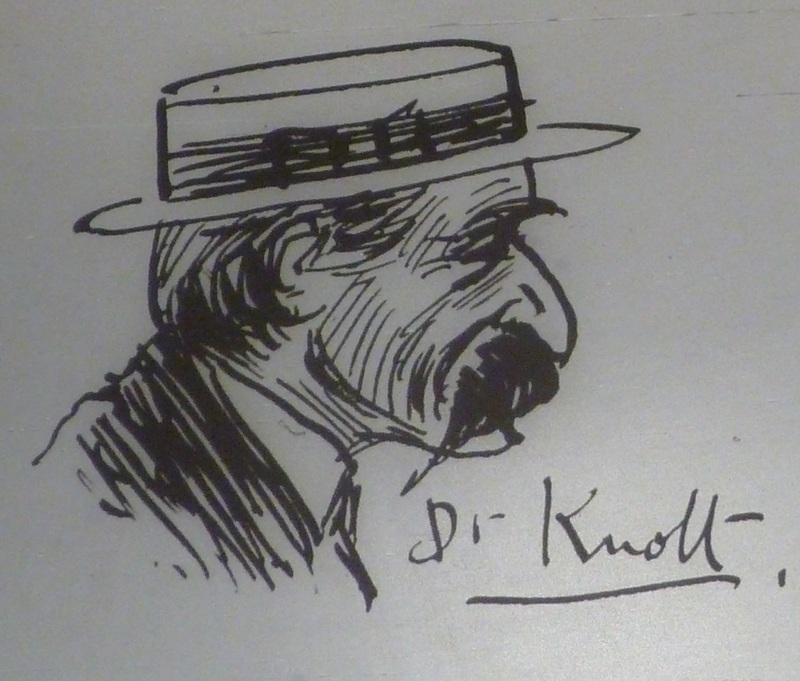 Film lover Dr Knott. Holloway Diaries. National Library of Ireland. Even the film drama – “England’s Message” – which was loudly applauded – he sneezed often. ”Though its subject wasn’t to be sneezed at!” I said to Eileen, & the man next her, who had been applauding his hands off almost when the foreign fleet in the picture story turned tail & went home, smiled at & approved of my turn of phrase. However, the behaviour of other audience members could be annoying, as it was on 8 July at the Grafton during the newsreel of Chamberlain’s funeral: “a man behind me kept up a regular tattoo with his fingers on the crown of his straw hat, which was irritating to all save himself. I know he maddened me!” Some people he knew were regular picture house patrons. James Crawford Neil enjoyed natural history pictures (23 Jul. 1914). Dr John Knott, “haunts the picture houses” (16 Sep 1914) and seems to be constantly “seated rather close up to screen” (30 May 1914). Like Knott, Holloway also haunted Dublin’s picture houses, and despite his periodic fears about cinema displacing his beloved theatre, he appears, on balance, to have enjoyed his time in front of the screen. “Between the Acts.” Irish Life 10:2 (24 Jul. 1914), p. 68. Condon, Denis. “‘Temples to the Art of Cinematography’: Cinema on the Dublin Streetscape, 1895-1929.” Visualizing Dublin: Visual Culture, Modernity and the Representation of Urban Space. Ed. Justin Carville. Bern: Peter Lang, 2013. 132-54. “Drama in Dublin: Premier Picture Palace Application: Lord Mayor’s Views.” Evening Herald 7 Aug. 1914: 2. Ferriter, Diarmaid. “Holloway, Joseph.” Dictionary of Irish Biography Online. Cambridge UP and Royal Irish Academy, 2009. Web. 30 Sep. 2014. “Masterpiece Theatre.” Evening Telegraph 22 Sep. 1914: 2. “O’Connell Street Pictures.” Evening Telegraph 15 Sep. 1914: 2. “What Is a Revue? Manager Tries to Explain It: Drama in Dublin.” Evening Herald 6 Aug. 1914: 3. This entry was posted in A Life for a Life, Across the Hall (US: Keystone 1914), AE, Audience, ’Fraid Cat (US: Vitagraph 1914), Behaviour, Bertie in the Ladies’ College (Britain: Eclair 1914), Between the Acts (Irish Life), Cathal MacGarvey, Child o’ My Heart (Britain: London 1914), Coliseum Theatre (Dublin), Devil’s Gap, Dorset Street PIcture House, Dr John Knot, Dublin, Dublin Civic Exhibition, Eileen O'Malley, Empire Theatre of Varieties, England’s Menace (Britain: London 1914), Etta of the Footlights (US: Vitagraph 1914), Finger drumming, Fred Willmott, From Inverlaken to Shiedegg, From the Lion’s Paw, Gaiety Theatre, George L. O'Connor, Henry Street, Hippodrome, His Reformation (Britain: London 1914), Ivy’s Elopement (Britain: Ivy Close Films 1914), James Crawford Neil, Joan of Arc (Italy: Savoia 1913), John Bunny, Joseph Chamberlain’s Funeral, Joseph Holloway, Lorcan Sherlock, Lost at Sea (France: Eclair 1913), Love Triumphant, Mary Charleson, Masterpiece Theatre, Maurice Costello, Melodrama, Music hall/Variety theatre, Nan Good-for-Nothing (Britain: London 1914), Our Cavalry’s Wonderful Horsemanship, Patent hearing, Picture House Grafton Street, Picture House Sackville/O'Connell Street, Proprietors, Queen's Theatre (Dublin), Review of the National Volunteers at Enniscorthy by Mr. John Redmond (Ireland: Gaumont 1914), Rotunda PIctures, Royal Bioscope, Scenics, Sketches, Sneezing, The Afghan Raiders, The Black Pearls (US: Geroges Méliès 1914), The Blood Test (US: IMP 1914), The Game of Life (US: Selig 1914), The Mansion of Sobs (US: Lubin 1914), The Master Crook Turns Detective (Britain: British and Colonial Kinematograph 1914), The New Medicine Man (US: Kalem 1914), The War Bonnet (US: Kalem 1914), Theatre, Theatre Royal (Dublin), Tivoli Theatre, When Lions Escape (US: Columbus, World War I and tagged 1911 Census of Ireland, Architect, Attorney-General, Entertainment conglomerates, Handbill, Irish LIfe (Journal), Joseph Holloway's Diaries, LIfe Writing, Solicitor-General, Unruly elements by EarlyIrishCinema. Bookmark the permalink.